For larger project, it’s crucial to be able to collaborate on test creation and execution. 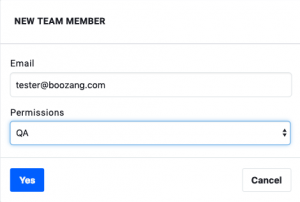 Boozang’s in-built team work function allows you to add team member directly in the browser interface. As soon as a user is added, he or she will receive an invitation email to join the project. Boozang supports the following permission templates. These are only suggestions, and access rights can be further customized in the management interface.